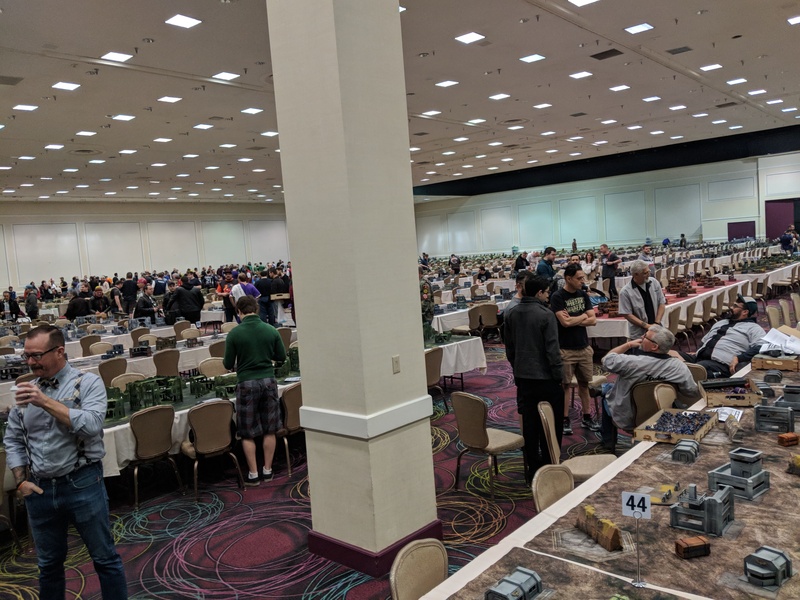 I played at the Las Vegas Open (LVO) 40k Champs this year, and went 3-3. Overall I feel pretty good about it, and had some close games. 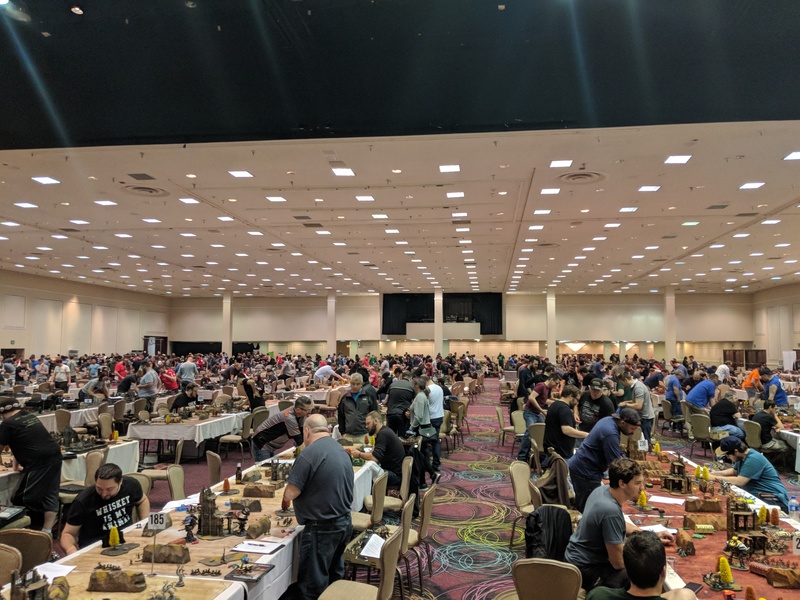 The Las Vegas Open is one of the biggest, if not the biggest Warhammer 40k tournament in the western United States. This year there were 600 competitors, with 6 rounds of swiss-pairing play for normal competitors. From there, the top 4 would advance to the final day's round of 8, and positions 5-12 would play a single elimination round for the remaining 4 spots in the round of 8. The final day was single elimination among the top 8 players. 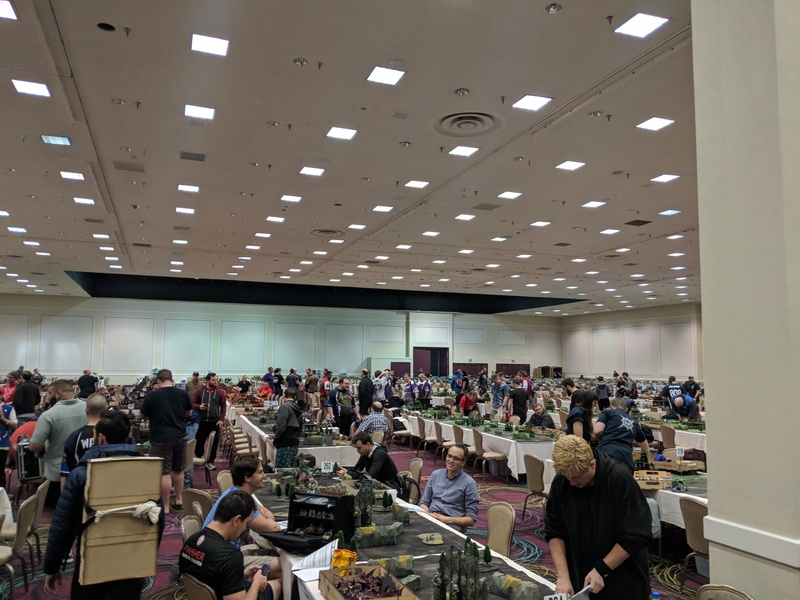 The event took pace at Bally's which has a spacious event center. 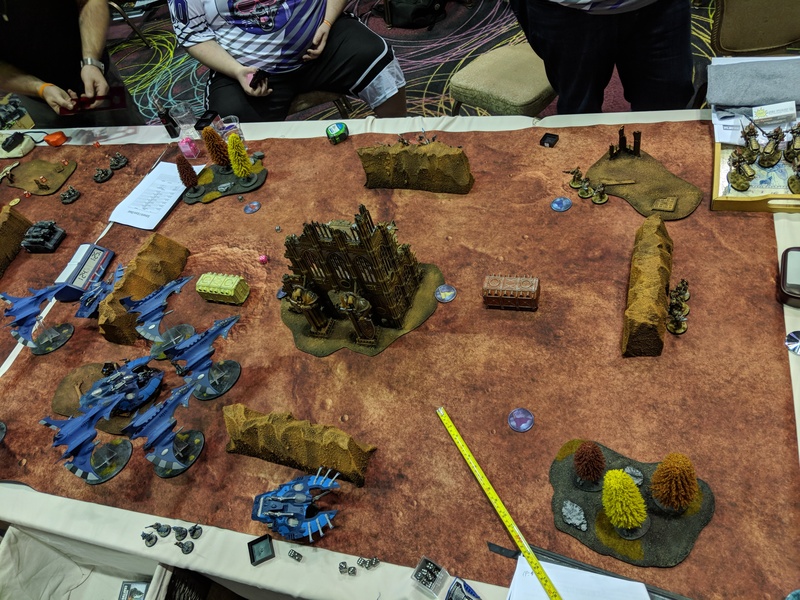 Terrain was adequate, with every table sporting 8 pieces of terrain, at least 4 of which were LoS-blocking, some of which would sometimes be non-LoS-blocking cover, as well as a significant terrain piece in the center of the table. 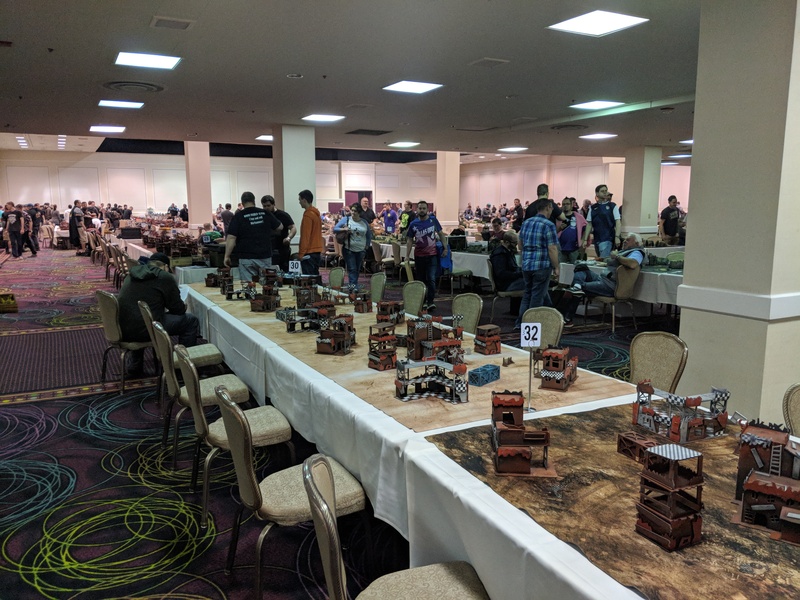 The top tables had more significant terrain and line of sight blockers. There were many contestants with cool armies playing lots of games, making for a festive event. Overall, the logistics and organization of the tournament was excellent. I never ranked high enough to play on a table with chess clocks on it, but I brought my own and the tournament rules allowed for its use if one player brought it. As a result, I was able to finish every game with both me and my opponents getting the full 6 turns, something I'm proud of. Having a clock really helps you remember to keep things moving. Fast food was available for purchase between rounds and before the first round each day, and it was edible if bland. 17 USD for a plate of fried breaded chicken, potato chips, and a soda. Each round was 3 hours, and the missions used were the ITC missions. I ran an Alaitoc list focused on mobility and defense. This time, I decided to run with more flyers and fewer wave serpents, since the points costs for wave serpents went up. I also decided to give Illic Nightspear a try, since he is a natural choice for an Alaitoc list to supplement the ranger sniping. I made the Farseer my Warlord and gave him the Faolchu's Wing relic so he could keep up with the rest of the list. My Warlord Trait was usually Seer of the Shifting Vector so he could reroll a second psychic check if he failed it, but if I was up against snipers or the knight sniper-missiles I'd give him Fate's Messenger for the extra wound and the Feel No Pain so he'd last longer. 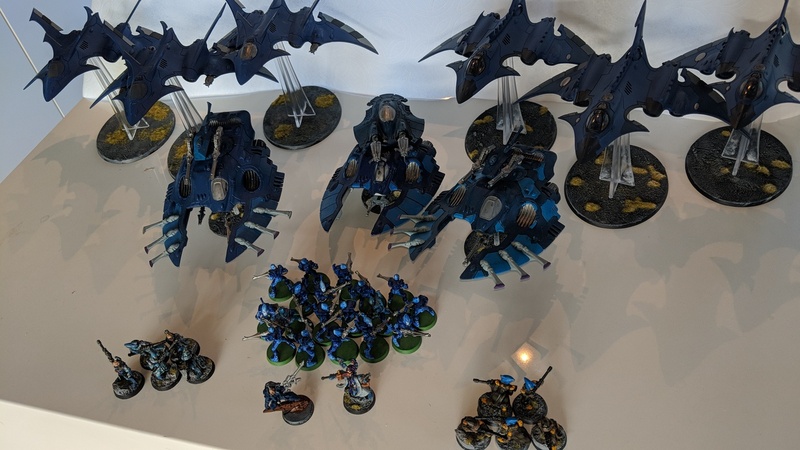 This army consisted of pure custodes - Trajann, a shield-captain jetbike, 3 custodian guard squads, a big warden axe squad, a banner bearer, and a big jetbike squad. 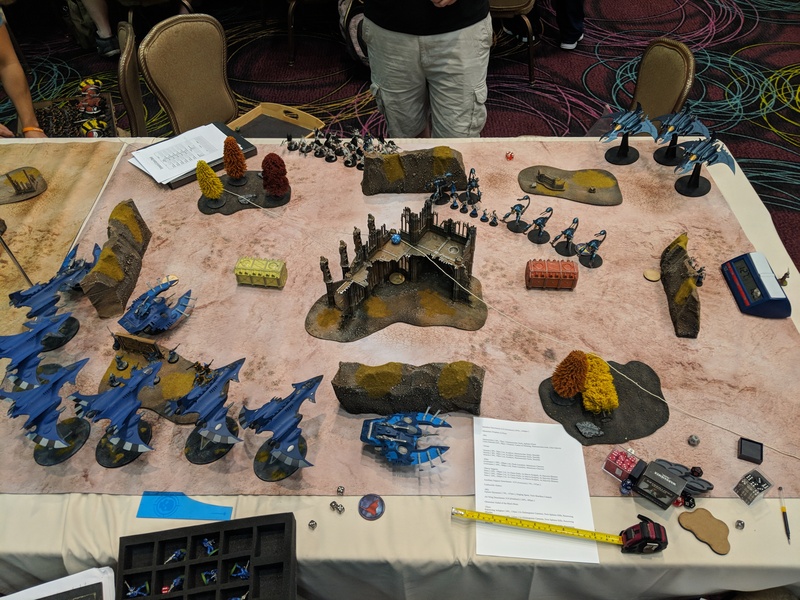 Since this opponent lacked any sort of anti-tank shooting, his only way to threaten my flyers was with his big jetbike squad and with his shield-captain jetbiker. 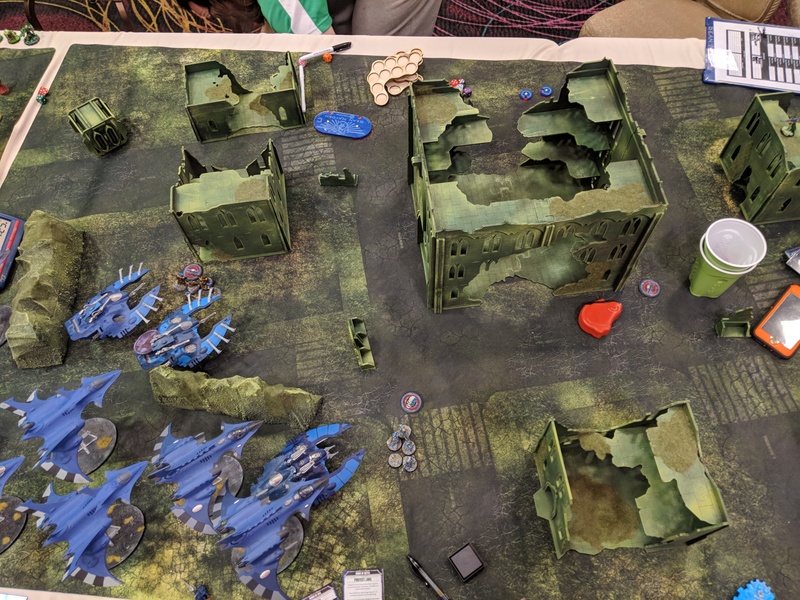 Luckily, the terrain didn't favor hiding squads easily (no enclosed ruins to hide them from flyers in) so it was easy pickings after the jetbikers were shot down. This was an army I was well prepared for - a Castellan, a Crusader, and a Gallant, backed up by an imperial guard battalion. His knights proved pretty tough, but his Leman Russes died quickly to my firepower, and I was able to box his Gallant out away from the rest of my army by having my flyers, 2 by 2, end their turns in front of it so it couldn't move forward. In a situation like this, he can't walk through the ruins or the impassable terrain, and my 2 flyers block him from moving forward. Since the Gallant lacks the fly keyword or any sort of guns, there's nothing it can do against the flyers. His Gallant contributed nothing to the game until Turn 5, so I was able to deal with his other threats then take it down at my leisure. 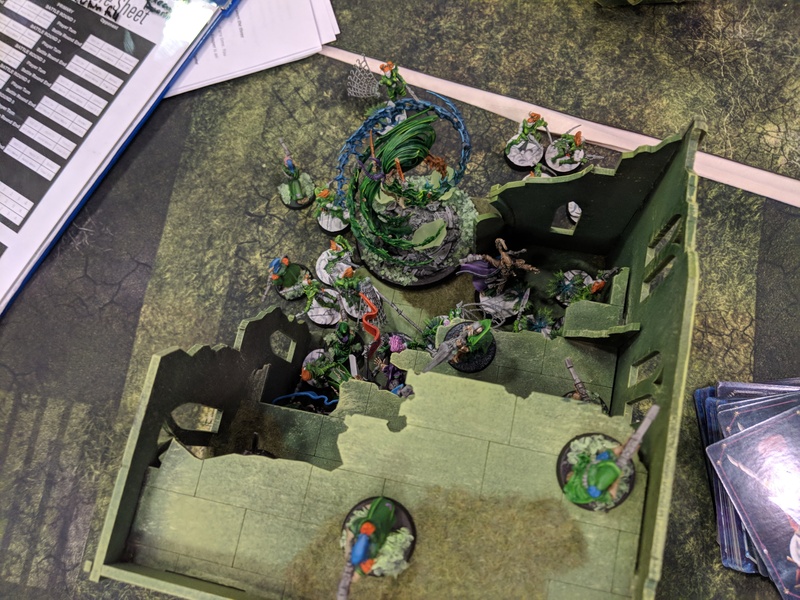 My general strategy was to have rangers and Illic stand in my backfield and harass enemy characters, and use the rest of my army's extreme mobility to strike in a concentrated way at one part of the enemy army. The Night Spinner would often stand near Illic to prevent my enemy from shooting at him if the Rangers all died. Wave Serpents would generally harass the enemy, contribute anti-infantry firepower, and nab objectives. My opponent here was a very skilled player running a unique and quite tricky list. Between two ynnari detachments, he had the Yncarne, Yvraine, Edlrad, Maugan Ra, 2 death jesters, a solitaire, and a big Shining Spears unit. He also ran a Wyche Cult Battalion with a bunch of shardnet wyches. His list mostly revolved around a lot of the big damage dealers - the characters with smites, powerful shooting, etc - not being targetable by shooting. This wouldn't be contained only to his characters. For example, he'd charge the shining spears into combat with an enemy, or soulburst them to slide over into that combat after killing something, but that enemy would *also* be in combat with some shardnet wyches and not be able to retreat. In the end, I lost this one pretty handily, 15-36, but it was a very unique list and the guy went on to make top 8 so I don't feel too bad about getting dunked on. 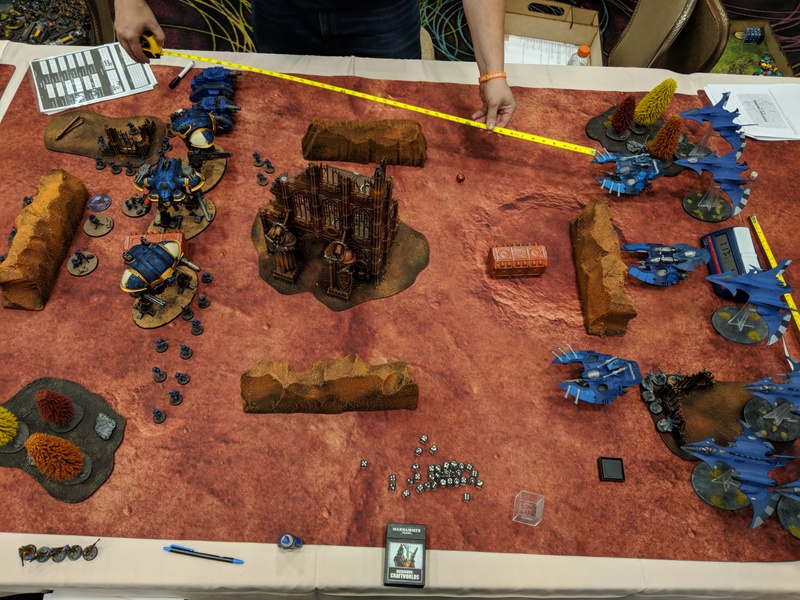 This opponent was running a list that included a Death Guard detachment with 3 Plagueburst Crawlers, and Alpha Legion detachment with a jump pack lord, 2 sorcerers, 60 cultists, 2 oblits units, and a Daemons detachment with some nurglings and flamers. This is a battle where I really screwed things up. I started off with a big advantage - namely, that my opponent didn't have any accurate anti-tank shooting other than his oblits, and I was able to take out both units while taking almost no damage from them. However, my inexperience handling 6 flyers showed up when I was forced to fly 2 of them off the table. 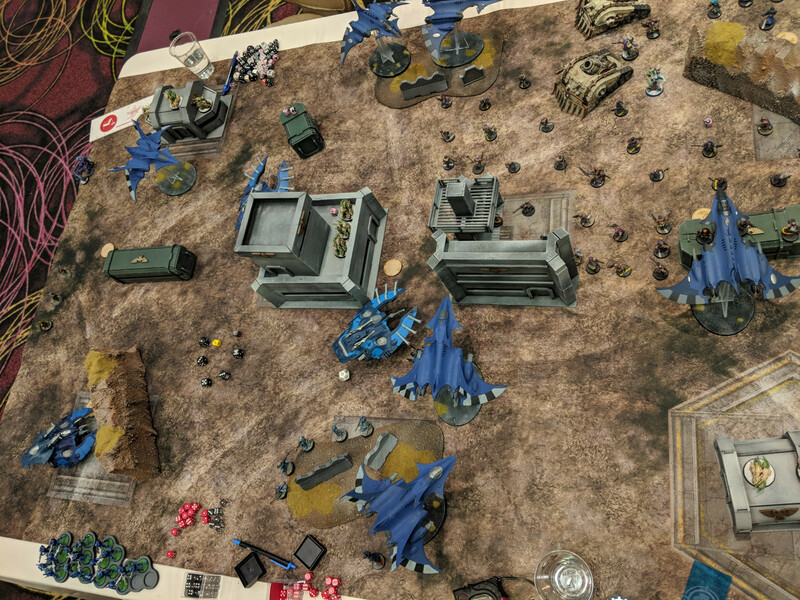 Despite flying 420 points of Hemlock Wraithfighter off the board on turn 3, I kept at it and almost managed to seize victory from the jaws of defeat. Sadly I lost this one 26-28, but I certainly won't make that mistake again! This opponent was running a more guard-heavy list that still was about 50% knights, bringing along the Armiger Helverin knight units. His army was 32 guardsmen, 2 wyverns, 2 Basilisks, a Castellan, and 2 Helverins. He played very aggressively with his knights, grabbing the center of the table and forcing me to dance around him. Initially, I focused on his Castellan and his artillery, figuring that the Castellan was the strongest unit and the artillery were vulnerable due to their lack of invuln saves. This proved to be a mistake, as after 2 turns his Helverins had done significant damage to my flyers. With their high-damage autocannons, they are almost uniquely situated for the task. In retrospect, they should have been my first target, and I should have used prepared positions stratagem when he won the first turn. Still, at a 26-27 loss, I must say this was an exciting and close game, one of the most fun ones I've had in a while. For my final game of the tournament, the courageous Alaitoc warriors faced off with the dark kin! My opponent ran a Haemonculus Coven list with Urien Rakarth, a Haemy, 3x5 Wracks, 2x8 Grotesques, and 3x2 Taloses with Haywire. This was supplemented by a single Farseer on a Jetbike (for Doom) and an Air Wing of 3 Razorwing Jetfighters. 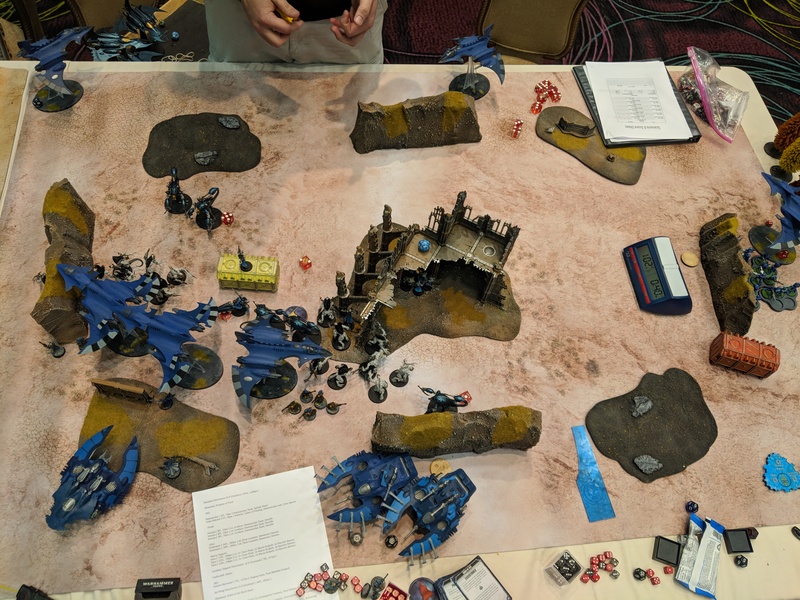 My opponent immediately leaped forward and tried to crash into my frontlines, so I swung my army around the side and hit his objective-sitting Wracks units. My Guardians arrived inside his deployment zone using Webway Strike and his own backfield collapsed entirely. However, even with my other flyers trying to slow the Grots down by blocking them, the Grotesques chopped up the night spinner, the rangers, and Illic Nightspear. 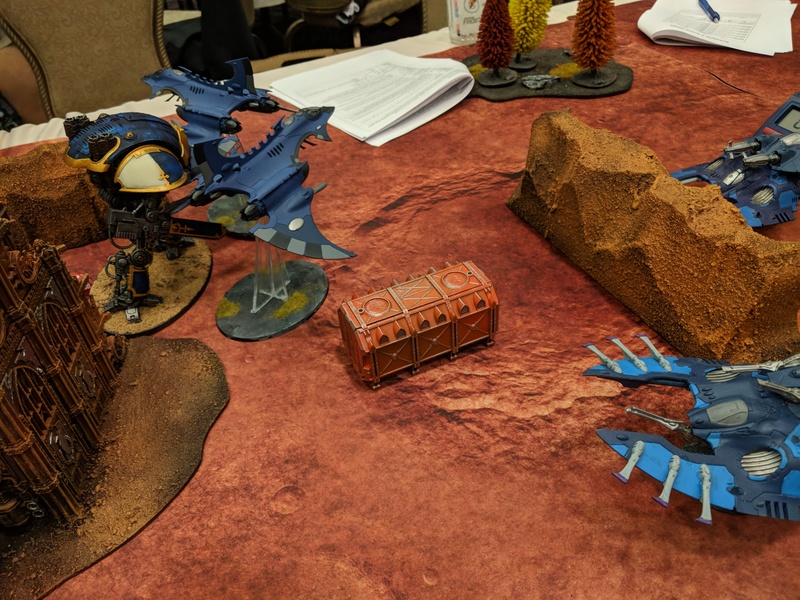 I managed to get the Farseer out by hopping him into a wave serpent and having it scoot away, while the other wave serpent bravely sacrificed itself to slow the grotesques down a little. As we entered into the final turns of the game, I blew away the last of his taloses. His jetfighters had been taken down by mass firepower early on, which meant he had no way to deal with my flyers any more. However, with his control of the center and my own deployment zone, he was still scoring plenty of victory points. Through a combination of careful movement and some courageous action by my Farseer, I was able to pick off a couple of his characters in the last turns and win 26-24. 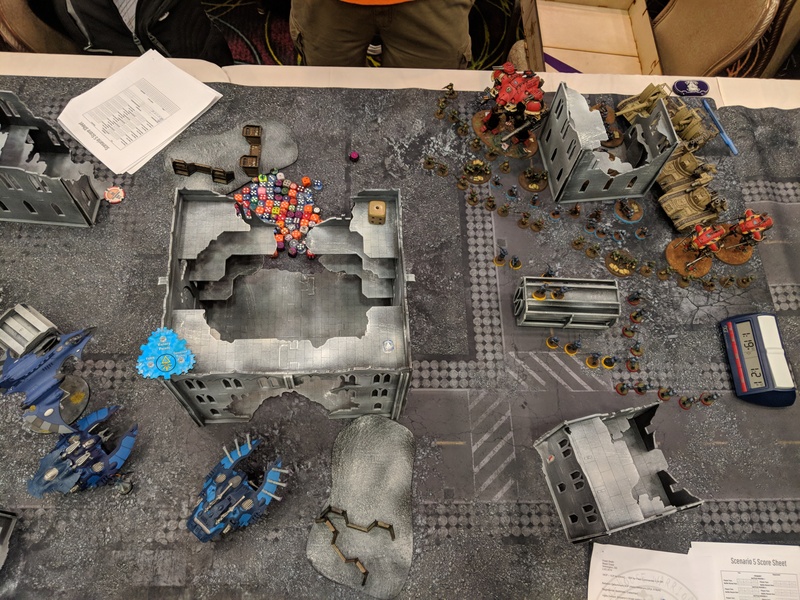 By the end of 18 hours of wh40k over the course of 2 days, my back was sore from leaning over all those tables, but I had a lot of fun and played many close and exciting games, particularly on day 2. Overall, I had a great time. Thanks for reading. That's a lot of 40K in a relatively small area. All air conditioning units to military power indeed. Thankfully I didn't have any particularly pungent opponents or immediate neighbors, but it wasn't the most pleasant of places 9 hours in at the end of the day. Many people I think were thoughtful enough to reapply deodorant or antiperspirant between matches, or at least during the lunch break. That's a nice looking army you have there! 3-3 at a big tourney like that is no small feat, so congrats. It looked fun!